Boston Town have signed defender Tyler Walker ahead of the 2018-19 campaign. The 19-year-old right back spent last season with Biggleswade Town, having come through Doncaster Rovers’ youth ranks. 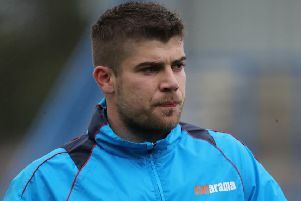 Fellow former Rovers youngster Keegan Townrow has also agreed to remain at the DWB Stadium following last year’s loan spell. Meanwhile, the Poachers have also fought off competition from higher-level clubs to retain the services of striker Cameron Johnson. Duran Reynolds, James Lambley and Loz Lambley will also remain with the club following spells on the sidelines last season. “We’ve reatined everybody who was with us at the end of last season and signed Tyler Walker,” manager Dennis Greene said. “We’ll train hard in pre-season and have a real go. Lori Borbely will remain as Greene’s number two, with former Boston United midfielder and coach Paul Cavell joining Glyn Creaser in a coaching capacity. Former coach Derrick Nuttell and striker Jordan Nuttell have joined UCL Premier rivals Pinchbeck United. Town’s current squad is: Duran Reynolds, Loz Lambley, James Lambley, Bailey Forth, Simon Ashton, Jason Field, Tyler Walker, Keegan Townrow, Fraser Bayliss, Richard Ford, Ollie Pinner, Cameron Johnson, Jordan Tate, Seth Greeves, Mido Turki. Bailey Forth and Ollie Pinner.